I've put brass etch on a model once before. 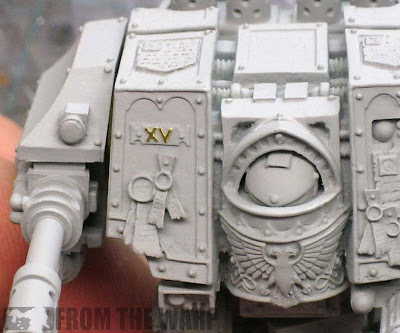 This time, I was trying to put some incredibly tiny letters onto the front of a dreadnought sarcophagus. Having been given a link to a video that shows you how to put the tiny stuff onto a model without going crazy trying to get it into position correctly, I figured it was time to give it a go to see if I could do it. 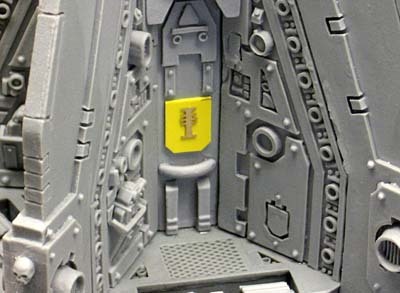 My one previous brass etch experience was with a drop pod and I was setting Inquisitorial symbols into the crew area to cover up some holes in the model. The things is, they were larger in size and easy enough to handle. That and I didn't have to work directly on the model. The brass etch was set on top of a piece of plasticard and that was in turn glued into the model. What's the point? I had plenty of room to work and the brass etch was big enough to handle. Tiny letters glued directly onto a model have neither of these benefits. When it came time to do it again with the letters, I wasn't sure where to start. Seriously... this has got to be the most helpful thing on the planet to watch before trying to add tiny brass etch lettering to a model. The only thing I did different was to use clear tape for everything since I had no blue tape to work with. I'm not sure how I would have done it without seeing this first. It seems so simple after watching the video. 1. Adding it to curved surfaces is going to be a bit tricky. I'm sticking to flat surfaces for now. 2. Cutting the smaller pieces out can be harder to do than you think. Even though it's paper thin, it's still made of brass. Having tape behind them (the super tiny bits) is essential so they don't fly away. 3. Cut close to the edge of your etch piece so you have very little to no clean up. Trying to clean up the edges on something that small is a huge pain. 5. You don't need much glue to hold them in place. Too much and it makes a mess. This stuff is great for adding some super fine detail to a model. Knowing how to do it so you don't go nuts or ruin half of your pieces trying to get one letter in place helps. 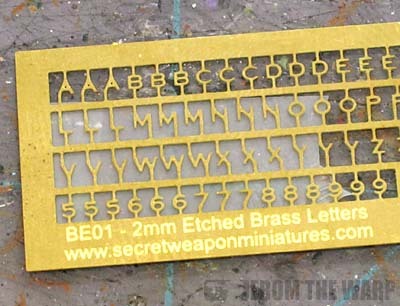 But... brass etch is not for everything. There are times when you'd be better off leaving the space empty or maybe going with some freehand. That's a decision you'll have to make based on your model and how you want it to look. Like weathering and battle damage, you just need a little bit to really help a model come to life. And knowing how to add this stuff to your model makes the whole process that much easier. This is really good. If I ever end up doing an army of the Imperium, I'll definitely have to put this into action! Nice! Never would have thought about the painter's tape to keep the cut-offs in place. So simple it's brilliant! Thanks for sharing, Ron - great tip! Thanks guys, but the tape is not my idea, I'm just passing it on so it might save you all some frustration if you decide to go the brass etch route. Tip: If you need to get the brass etch onto a curved surface you can heat the brass up with a hair dryer (while it's on the tape!!!!) and dry fit it against the surface you want it to match; often times the warmed brass will be pliable enough to bend to the shape of the surface and once cool will hold it's new shape. Bigger pieces may need multiple treatments and 2 plane curves are damn near impossible without cutting and green stuff but simple curse are pretty easy to match. Anon: Excellent, thanks for the tip on bending it to one plane curves. That would work great on greaves. Perfect timing on this! 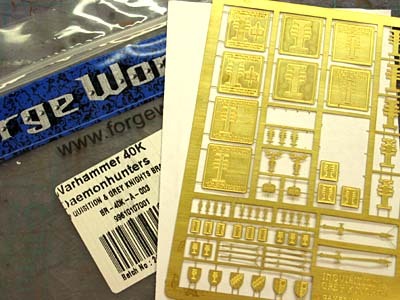 I'm about to order brass etch to go with a contemptor dreadnought, and have never used it before. Thanks also to Anon for the tip re: curved surfaces. geneguard: Excellent, hopefully this helps you get your model sorted out without any problems. All good stuff, wish i had seen this tip before i started building my 1:200 scale Bismarck which is about 70% brass and they are all teeny tiny pieces, so much of the ships windows are in the carpet monster after hearing the dreaded 'PING!" But i have seen you can now get etch brass clippers which look very useful as they are very fine. The Harrower: I'm lucky in that I was shown this video prior to trying it myself. Rick_1138: Ah... the dreaded carpet monster. Nothing ever comes back from there does it. I couldn't imagine trying to build a 1:200 scale ship. Those pieces must be microscopic. Ok time to blow your minds again. Attach brass etch with pva glue,this lets you position however you want without superglue residue,once happy let dry. Then use a needle and apply the tinest bit of superglue to the edges,capillary action draws the glue underneath. Will: Excellent tip! I like that one a lot for positioning the stuff on a model. I find that I can heat the brass up enough with my fingers to make it malleable for curved surfaces. 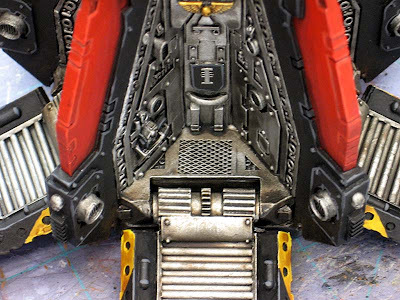 All of my Deathwing Terminators have little brass DA symbols on their hip armour plate thingies. They are fiddly as hell to work with, but I just couldn't imagine making Deathwing without them. Sendraks: I'm going to add them to mine when I get to them... but I think the area I'll be putting them down is fairly flat. Or enough that I might be able to get away with a slight bend as well. The ICs: I'll have to see what you guys say, it's time to catch up on podcasts today while I paint. The heated bending works quite well. If you go back on my blog to the World Eater Dred. I did that for the chest emblem to fit on the front of the Contemptor. Will: After hearing how so many people do it with warming and bending brass etch to get it curve slightly, I'm tempted to try it on one of my models now. Nice work on that dread too!